Once again, I turned to an every day set of papers to create my winter scene. Love getting more mileage out of my papers this way! For this card I used a 6x6 paper pad from My Mind's Eye Stella Rose collection. The prints are reduced in size which work perfect for these small images! The hills were diecut from glittered cardstock using Papertrey Ink's In The Meadow die set and snowflakes cut using the Winter Penguin dies. 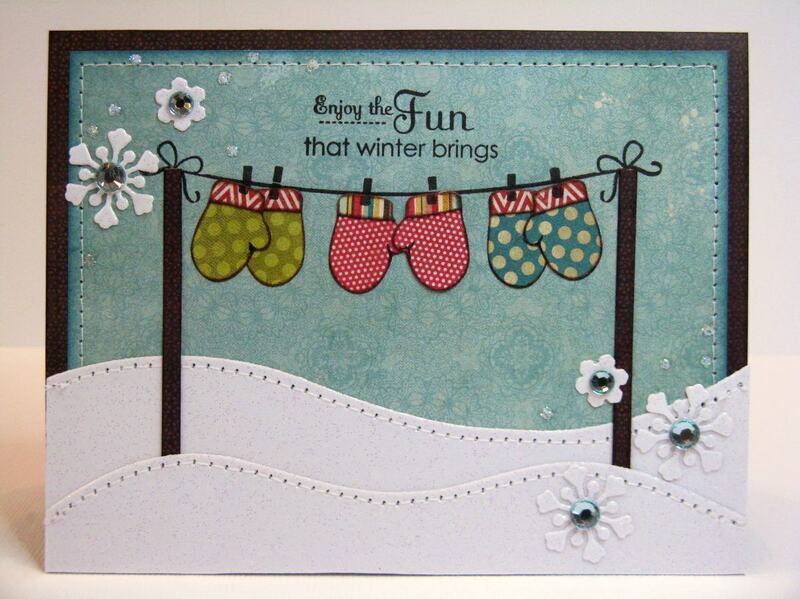 I got creative for the clothesline (if I do say some myself) and borrowed a stamp from a baby set called Hanging Out. The mittens were made by diecutting the patterned papers using the Shape-up Snowman dies and then inking around the edges with my chalk inks. I had a lot of fun making this one! Such a sweet design. Love the stitched layers of snowy landscape, perfectly done. Mendi this card is gorgeous! I just love your work! This is so, so cute!! Love those adorable mittens, and your stitching just makes it simply perfect! !